With the advent of email and colorized computer software programs, we are now able to transport the Pompei Studio into your living room. You will work directly with Joseph Pompei, who will assist you you in determining a design direction as well as the selection glass colors and textures. Contact Joseph Pompei at 781.395.8867 to initiate a discussion about your project. You will discuss your goals, design themes, color palette, privacy requirements, and budget. After determining a preliminary design direction, you will be provided with an accurate price quote, including crating and shipping charges, along with an estimated timetable for delivery. If you decide to proceed with the commission, you will be asked to provide a design deposit of 20% of your total order. After receipt of the design deposit, a colorized design proof, drawn to scale, will be prepared for your review. The design will be either emailed or sent to you via the US Postal Service. A sampling of actual glass color chips and textures along with a glass color key will be mailed to you at the same time. Upon final approval of your design and selection of your glass, you will be asked to approve the design by signing off and returning the design to Pompei & Company, along with the balance of a 50% deposit as a fabrication deposit. You will be notified when your commission has been completed and ready to ship, and be given the choice of paying the balance due C.O.D. or by prepaying with a bank check, VISA, or MasterCard. 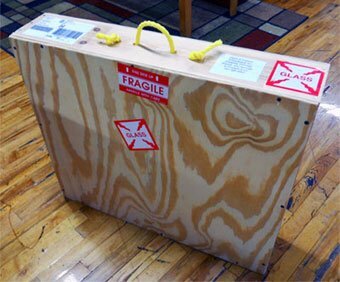 In order to assure that your purchase arrives safely, we build a museum quality custom crate for each order. 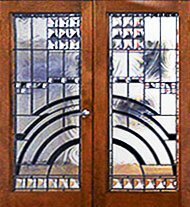 Your stained glass panel is double wrapped in 1/2″ bubble wrap and comes with any special installation and maintenance instructions. The inside of the box is padded on all four side with 1″ Styrofoam. We take extraordinary effort to protect your order from any potential shipping damage. The rope handles allow for easy and safe handling. Your order is insured for the full purchase value, should any problems occur while in transit. Most orders ship free to your home or business via FedEx. Large size panels or large quantity orders sometimes need to be shipped via Freight truck. Delivery is free if you pick up at the local terminal. Should you wish to have the order delivered directly to your residence, there is a $150 home delivery/lift gate charge. Unauthorized use of the images contained within this website is prohibited.